Now that lack is back, will this one be quenched? I dont ever seeing this becoming much of a team map and it is kind of a bummer since it is such a large and intricate map. On a side note Rev Paris being a 4 neutral kind of locks someone into that starting territory behind it. It seems that the map would be more fun if each of the reverends were a +1 autodeploy instead of a +5 for all 4 because it seems very unlikely many games will ever have someone go for the +5 bonus. Or maybe make them 1's instead of 4's so people can get out of the starting spots. They are so spread out it should have no impact on anyone grabbing all locations for a bonus in less than 4 rounds. EDIT: Additionally did u consider makeing all the 2 netural territories 1's to encourage people to take them more or do the 1v1 players think that would drastically give the first player a huge advantage? Lol I am not official, tho I wish I could! So is this a joke or are you 4 real? There's a reason because i've not done it yet. thenobodies80 wrote: There's a reason because i've not done it yet. You keep saying this, but never say what it is. Other maps as well have been ready for quench and you've said have nothing to do with the maps. What's the hold up? I'd like to hear reasons, or start seeing some of these finished maps get quenched. OK. I can take a joke. But i must ask you to remove your quenched stamp from the thread. I take this stamping process somewhat seriously and you have interefered with that. 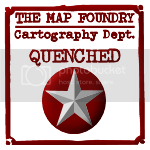 There are other ways to bring to "quenchers" attention that fact that you as an individual want this map stamped. While i agree it should have been stamped a long time ago, i do not play around with the foundry process when anauthorised to do so, nor do i beleive anyone else should. And yes tnb80, if you are having trouble to solve the problem you have (being the reason for this delay of quench) then perhaps by sharing it with the foundry you may acquire a solution to it. Or it this another lackattack issue? We have seen lackattack on leave but there has been no explanation why the slow down from your side of things apart from "painting your house" has occurred. Once upon a time, the foundry used to be open and honest, but lately we have seen the "Italian" influence enter and while generally things are well done, there are the odd occassions where a sort of "underground information set" applies and the public is left wondering the hell is going on. I am left wondering how much of a bribe i have to offer. So please, enlighten us as to your reason/s why this is taking so long for all the maps to be quenched, since i am not the only one where this applies. Clearly my name is not blue and I have no authorization or ability to quench your map, it clearly was made in jest. I have been discussing with tnb80 for a few weeks now about stamping/quenching the map(s), it was meant for him / as a joke and not aimed to confuse you or the foundry as a group. Good luck with the quenching, and enjoy your weekend. IcePack wrote: Clearly my name is not blue and I have no authorization or ability to quench your map, it clearly was made in jest. I have been discussing with tnb80 for a few weeks now about stamping/quenching the map(s), it was meant for him / as a joke and not aimed to confuse you or the foundry as a group. Yes, clearly your name is not in blue, but that doesn't mean the job cannot be allocated to you...i have seen occasions in the past where an ordinary person has done the job of a blue man, so to my thinking it is entirely possible this has happened without the knowledge of the public. While your joke may have been meant for tnb80, it was not directly named as such and therefore in a public thread is open to interpretation by everyone. Clearly i had no knowlege of your intention, and yes i too should have known better than to accept this. I appreciate your good intentions, but as stated, there are other ways to go about this. You too have a good weekend. ---The Beta period has concluded for the Salem's Switch Map. All objections have had their time. The Foundry and I hereby brand this map with the Foundry Brand. Let it be known that this map is now ready to be released into live play. First of all congratulations for your 30th map achievement! I think I've already mentioned to you the medal issue, but since you all ask for being totally open. I'm officially asking for a solution to have all your other maps noted somewhere, if possible on the profile. As you know we can award just 30 medals to a user. But I can't live with the idea that a mapmaker (you or everyone else who succesfully develop a map) can't have a medal or the map noted somewhere because there's a limit that can be changed via phpBB. I did some test and I proposed to admins 3 solutions. I'm waiting for an answer, but yes, not a totally good reason to hold all the maps. So I'm going to quench all maps that can be quenched, but asking to you to be a bit patient since I'm working behind the scenes for you (and I hope many others in the future). Bloody hell cairns, 30 maps now. What an absolutely fantastic achievement to get. And to get it for this one, a mighty fine map. Thank-you all, and thank-you tnb80 for the stamp. Wow - 30 maps? That's quite the accomplishment. Kudos! Congratulations on your 30th cairns!!! Please consider changing the buggy stop "territories" so that they don't have a spoils "card" attached to them. I have played quite a few Salem's games, especially Nuke, and the spoils play a very minor role (if someone likes it that way, they can play No Spoils) when half of them are buggy stops.